« Is White Nationalism Un-American? Published: April 17, 2017 | This entry was posted in North American New Right and tagged Battle of Berkeley, Donald Thoresen, Left vs. Right, liberalism, North American New Right, originals. Both comments and trackbacks are currently closed. The Left is pulling one of its old tricks: recruiting a bunch of suckers into challenging Right-wingers in ways so provocative that a bloody reaction is highly probably. I suspect “Moldylocks” is not even close to being trained cadre — she is probably just a poor little fool. I don’t advise martyrdom on our side. Martyrdom is pointless without cameras. But if we have enough cameras, we don’t need martyrs. We need footage and good video editors. Final point: we should take a few hints from the anti-cult movements of the 1980s and get some personal confessions. Nobody wants to see their kids turned into riot-fodder for the “antifas”. Excellent work, punching back hard in your own way. Landfill passage was particularly pithy. Great to have the occasional morale boost/call to arms like this. Some pragmatic hope amidst the dismal tide. Thank you. But what we saw in Berkeley this past Saturday was, in fact, the real world. We need some up front reporting on actions like this. I saw something on a couple other websites, but a major confrontation like this ought to be headlining every last Alt Right, White Nationalist, Race Realist, Paleocon and AnCap website. Tactics: what worked? What didn’t? What kind of media supported the action? What about legal defense and crowdfunding comrades who might be taken down by the Left or arrested? Alliances: there was mention that the Oath Keepers were involved. Apparently, they have done some intel work on “antifa” which provides invaluable information. And they do seem to be getting out in the streets. What about the Militia movement? And is it too much to ask various gun rights and free speech groups to take it to the streets? The NRA is always going on about defending our freedoms–perhaps an (unarmed) contingent could show up and show the flag. Joining up: let’s see some advance notification about such actions. There are people who want to get in on the action. And not just streetfighters, but also activists in media, flyering, legal defense, combat first aid, and etc. 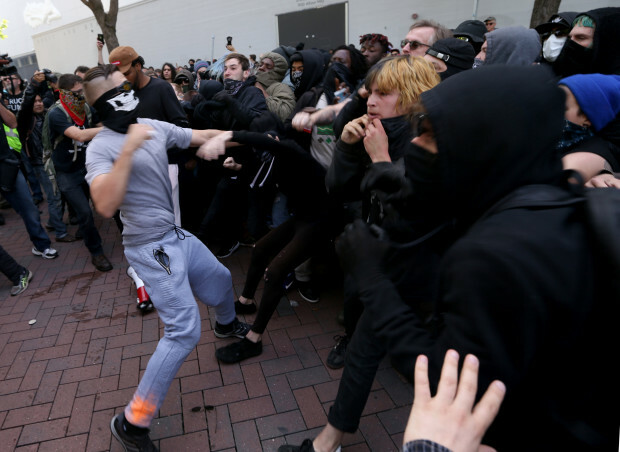 Intel: How does “antifa” fight? Who are their members? What are their vulnerabilities? Who is funding them and how can they be exposed? Payback: there is a pool of potential recruits in Trump supporters who were attacked during last year’s campaign, as well as moderates who have been victimized by mob violence on campus and just generally fed up Americans. If approached correctly, they could take the opportunity to join the counterattack. Networking: how about a press release and some video posted to those Alt Right etc., both in the USA and across the world. Create a sense of transnational solidarity and engage bin infowar swarm attacks to bolster the cause and attack the foe. Anyway, congratulations to everyone involved. Interesting essay, but the question is, what are you going to do? As you admit this is what life boils down to. As an example, the Nazis invaded Russia, and then when they were losing, declared, we will fight until the end and rather be destroyed than surrender. Are you willing to take things to these extremes? Are you ready to make war upon every non white in America (now roughly 40% of the population), no matter the consequence? Are you ready to start hanging your own elites, who have openly declared that there will be no such thing as a white America, and that America will be the focal point for corporate globalization? Look at all of the effort you put into backing Trump, and he caved to the establishment in a few months. I cannot really tell if by “you” you mean me specifically or “we.” But since it seems that you mean me, I will respond to your question with a more important question: what are YOU going to do? Part of what I do is self-evident, isn’t it? You just read it. Pincer movement – send two columns out to the left and to the right of the enemy position. The left works to destroy the dominant White culture while the right works to create Greater Israel. However, thus far, the projections are such, that what is presently known as “White” America, will in fact become closer to “post-racial”, via complex hybridization. I think it is useful to slightly alter the adversary here, from the “Left”, to Black People (and Brown people, and non-racial Europeans more broadly). For, Blacks living in a White Country, likely are discriminated against on a daily basis, to some degree or another. At least for Blacks not already living in a near- or entirely Black America (e.g. Detroit or Baltimonkey). So you see, Blacks can never forget, and are constantly reminded of their status, a status derived from inherent, and disparate, innate racial worth. No matter how much cultural-mind control of the high-Faith of Human Equality, social Darwinism has not, actually, ever really been discredited. And Blacks & the like, know this, even when Whites have been made to believe it is no so. But, of course, for now, we Blacks, et al., lack the power to do it full-bore, but pressing hard for “Diversity”, is a slower relief, Solution, too. This is why Minorities are not to be glorified, rather, they are internal enemies that need to be (omitted), else, they may (omit) the majority and replace it one day. The existence of minorities in a White Majority population, corrupt and rot the strength of the blood majority nation, from within. The Country/Nation ends up like an apple with a rotten core; even despite an intact & strong military exterior. It is nonetheless rotten from within. Eaten away, and turned into another substance. Distinct minorities cannot be; one way or another. Really good article. The Left will find out the hard way that they can only gnaw at the foundations of order and life preserving institutions for so long. People react when they see their existence threatened. An excellent essay. The leftists seem to believe in a sort of mind over matter; merely by thinking it, gender, race, and all other immutable facts can be erased totally, leaving the intellect to define reality as it pleases. In this way, their movement shows that any attempt to detach the intellect from nature and the beast-soul leads to insanity by an immediate short-cut. They’re certainly setting things up to get “sporty” when Kipling’s Gods of the Copybook Headings limp up to explain it once more. What destructive fools they are, bringing things to such a pass. The left is a religion of PC and an emotional ego driven attachment to being percieved as good. Just follow the rules that “good” guys who produce all your “intellectual” content and oppose the designated monsterous “bad” guys they have warned you about. Whose worldview is as foreign to your belief system, and that is all it is, as a fish on a boat. They feel like dying rather than consider they got duped. A good example of this phenomena of them trying to “mind over matter” anything into existence, is the Shia Leboef art stunt. The “he will not divide us” religious group chanting as if they could manifest the physical removal of a man like an exorcism. Anyway, the more they feel it slip away as their nightmare increases, the more their grasp on their religious belief in the system will fall apart. “There must be something wrong with this” is a thought they will have to fight off in their heads. Seeing that they thought they had moved passed us, only now to see a pushback they never could have imagined previously.